It’s funny, but this time around I had absolutely no nervousness around labour. It’s such a short span of time that any pain is really easy to forget about. I know I had a lot of incoherent-screaming-pain with Aiden, and yet I still felt completely ok with going through that again. Compared with months of pain during the pregnancy, it seemed like an “easy” end. As many of you know, I was scheduled to be induced on my due date (May 14) because of the pain the pregnancy was causing me (pelvis, back, neck, etc) – I couldn’t take care of Aid en, let alone myself. Our induction was pushed to May 15th initially, which was ok, but it all went messy from there. Originally, I was told we would go straight to the pitocin to induce my labour, but the midwife on call thought my cervix could use some extra work and gave me cervidil instead. I was sent home, which was very confusing for me. Initially, we tried not to let Aiden know we were home, since he thought we were having the baby. However, we had to drop that plan eventually when the induction didn’t trigger my labour. I had about 30 hours of early labour contractions, but nothing after that. With cervidil, the best plan is to return for a second dose the next day, often triggering labour with the back-to-back action. However, the hospital maternity ward was full and I was bumped off the schedule (as an “optional” induction, higher risk patients took priority). For the next 3 days, this continued to happen – at one point the entire hospital was on overflow and diverting patients. Meanwhile, I kept having on-and-off early labour and felt on edge all the time. I tried everything to trigger labour on my own, all to no avail (though it was nice to walk in our week of Spring sun!). It was the hardest week of waiting ever! Finally, on Saturday night, I was invited back for a second cervidil. Early labour began instantly again and I was sent home. At 2am, my water broke; by 2:20am, I wanted to go to the hospital. Apparently, my labour is back-to-back contractions (the cervidil had been out for a couple of hours already) and that’s just not fun. Thankfully, they weren’t as intense as they were with Aiden, but I still wanted drugs. When we got to the hospital, we had to wait for the midwife to arrive. My labour progressed very quickly and I was very ready for drugs by the time she got there. My waters gushed again and I was already 5cm dilated – soon after, I was started on the gas, which helped tremendously with the pain. The midwife was also amazing, really talking me through the pain (wow, midwives shine during labour!). If my pelvis hadn’t been misaligned, I would have considered labour with just the gas. As it was, I was too worried about tearing and could barely lie down from the pain associated with my pelvis and back, so I got the epidural. I love the epidural, but I had an adverse reaction this time. I got sick, my blood pressure dropped and baby’s heart rate was fluctuating. They were concerned from time to time, making me change positions often, but thankfully when the midwife went to check me again an hour after her initial exam, she was pleased (and surprised) to see that I was ready to push. I could feel baby descending and rotating with each contraction (pretty neat). After 20 minutes of pushing, Damien Grayson was born! The whole process, from when my water broke / active labour began to the birth, was 6 hours – not bad! The only hiccup so far in our parenting journey has been the unfortunate resurgence of my milk supply issues. I was hoping, as is often the case, that it wouldn’t be a problem with Damien, as second babies often see more milk. On some days, I’m able to supplement with just 3oz of formula (total), though his demand increased and yesterday (and likely today) will be more like 9oz – that was a bit of a shock last night. However, looking back at what I had with Aiden, it’s about the same quantity (maybe a little bit more). With Aiden, I dropped most bottles by 8 weeks and all bottles by 4 months. I’m hoping the journey is shorter this time, particularly as it’s more inconvenient to both breastfeed and bottle feed when taking care of a toddler. Not to mention trying to stick in cluster feeding and/or pumping. But, more than anything else, I find bottle feeding to be an emotionally discouraging process and look forward to one day stopping it altogether. I actually credit my milk supply increasing to Aiden being colicky – although it was super stressful, it meant he essentially cluster fed all the time. Since Damien is a more placid baby, that hasn’t been the case. While I have the help at home, I’ve been delaying bottles and extending feeding to include at least one long cluster feeding session during the day. This won’t be possible when I am on my own. Our nights are hit and miss, so I may end up breastfeeding more during some nights. When Damien sleeps, he sleeps really well; however, if he misses his bedtime window, his whole night goes off and he ends up waking up very frequently, which means more breastfeeding and more formula. I’m trying to be careful on the timing of his last nap to ensure his bedtime is easier, but you never can account for things like explosive diapers. Those just happen. Ah, newborns. I hate each and every bottle I have to give Damien, though I know in the end I’m doing what’s right. Sometimes self doubt crops up, particularly as people (online and off) can be so incredibly polarized on the breastfeeding issue, particularly stigmatizing those of us who need to supplement or criticizing how we choose to supplement. There are many opinions about what will affect your breast milk production and it’s all a very confusing situation – even with the help of the lactation consultant. I doubt myself often. So, wish me luck! I will need all the support I can get to soldier through the next few weeks. 1. Using a midwife does not mean that you must have a home birth. You can deliver at home or at the hospital, wherever you would feel the most comfortable. 2. 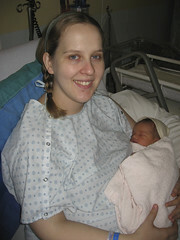 A midwife’s services are covered under MSP in BC so it does not cost extra to use a midwife instead of an obstetrician. 3. Midwives can order all the same tests, medications and drugs that a doctor can order provided that you have a healthy, uncomplicated pregnancy though a midwife is required by law to transfer your care to an obstetrical specialist should any complications arise. I was hoping for as natural a birth as possible and felt a midwife would be the best fit with my childbirth goals. Study after study has shown that women who deliver with midwives have lower rates of episiotomies, c-sections and other medical interventions than women who deliver with doctors. I also knew that a midwife stays in the delivery room the entire time while an obstetrician may only be there for the pushing stage (and in some cases may not arrive in time to deliver the baby). But there were lots of pleasant surprises that I was not aware of beforehand. Our midwives worked in a team of three and they structured our prenatal appointments so that we would get to know all of them well before “D-day.” We were so comfortable with each of them that it truly didn’t matter who was on-call the night I went into labour. All our prenatal appointments were done at our home, so there were no treks out to a doctor’s office only to sit in the waiting room. Our average prenatal check-up lasted 45 minutes to an hour–about 3 to 4 times longer than the average appointment with a doctor (according to our friends who went to obstetricians for their prenatal care). There was always plenty of time to ask questions, so we felt very prepared in the days leading up to delivery. In fact, we sometimes felt like we had a cheat sheet for our prenatal class because we’d already gone over so much of the information with our midwives. On the day I went into labour, we phoned our midwife to let her know my contractions had started. She reassured us and reminded us about what I would need during the early stages of labour. When my water broke, she came to our house to examine me and determined that it wasn’t quite time for me to go to the hospital (something I greatly preferred to the scenario some of our friends had been through where they went to the hospital only to be sent back home). When I felt an urge to push and an even greater urge for drugs, we called her and she met us at the hospital. From the moment we arrived, she was always there, guiding us through the final hours before our son’s birth. Her reassuring voice is one of the most positive memories of my birth experience. Once Zayden was home with us, one of our midwives came to check on us everyday for a week. They continued to be responsible for our care until he was 6 weeks old, when we returned to the care of our family doctor. The personal care we received made the whole experience more positive. I cannot imagine having another child without the three of them being part of the process. I have a confession to make: That first night in prenatal class when we all wrote on slips of paper about what we needed to feel like the class had been successful for us where someone wrote, “I want to learn everything I can so that I can be the best possible support to my wife when she is in labour,” and one of the other dads in the group said, “Someone’s lucky,” the guy who wrote that note was Justin. And I am that lucky. 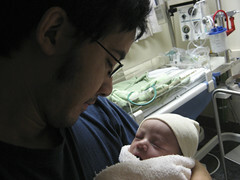 He’s a great husband and a great dad, and he was an amazing birth partner while I was in labour. I know I did all the hard work, but I couldn’t have done it without him. Make ice chips out of Gatorade. Giving birth is like hiking the Grouse Grind repeatedly for 24 hours; you get dehydrated really easily and you need to replenish your salts, sugars, etc. Gatorade will do this job better than water, and ice chips are very refreshing. Make mom eat some of these ice chips every few contractions. When a woman is in full blown labour, speaking (unless it is to shout expletives) is often difficult or impossible. She is so focussed on enduring the contractions and preparing for the next ones that she is unlikely to ask you for them, and she’ll get dehydrated quite quickly if you don’t force some ice chips or water on her. Put a chair by the door. When it’s time to go to the hospital, she will appreciate having somewhere to sit while you put on your shoes and coats, and she may want something to sit or lean on if she has a contraction before you make it out the door. Have everything ready to go when labour begins. As labour progresses and her contractions get more intense and closer together, there will be moments when you need to be in three places at one: holding her hand and helping her breathe, getting the heating pad ready for her lower back and packing the car to go to the hospital. The more prepared you get while her contractions are still something she can manage on her own, the easier the later parts of labour will be. Have everything for the hospital waiting by the door. Have comfort items and a glass of water with a straw in it close at hand and have your ice chips waiting in the freezer. Don’t jump the gun with pain meds. Don’t believe her the first time she screams, “I want a *&%#$@ epidural.” Believe her the first time she says it when she isn’t having a contraction. I asked for an epidural about 43 times before I was serious. In the middle of a contraction, it always sounded like a good idea, but as soon as the contraction passed, I felt differently. When I really couldn’t take it anymore, Justin knew and we went straight to the hospital. Throw the birth plan out the window. When we were preparing for labour, I had this vision of myself as a “Zen mama” and told my husband I wanted to use the breathing and poses from prenatal yoga to help me cope with the pain, and the idea of taking a shower or bath while in labour didn’t appeal to me at all. When the real thing started, the last thing I wanted to do was crouch on a yoga mat and took a hot bath instead. Practice your comfort measures ahead of time–at the very least they’ll make you both feel more confident and prepared–but be prepared to improvise if things don’t go as planned. Get in her face. When the baby starts crowning, your doctor or midwife will tell her not to push, so the baby’s head can come out slowly, which reduces tearing. The trouble is, there will never be a moment in labour where she will want to push more than at that moment, and she may not even hear what the doctor/midwife says because she’s off in “labour land.” You need to get in her face and help her resist the urge to push. Hold her hand/don’t touch her. This will really depend on her mood and how intense labour is at any given point. Don’t worry, she’ll make what she needs pretty clear. Stay calm and stay awake. Early on you may feel overwhelmed. It is hard to watch someone you love in so much pain, but stay calm and focus on helping make it as bearable as possible. As the day/night wears on, you will probably be tired. Just like mom, you’ve been up for hours, but you don’t have the hormones and adrenaline to help get you through. In all your preparation for the hospital, make sure to include some snacks and drinks for yourself to help keep your energy up. Do whatever she wants. That was the advice in one of my husband’s father-to-be books. Before labour, it made me laugh. Having been through labour, I know that it’s true. Do you have any wisdom from your labour to pass on? As soon as I was noticeably pregnant, I was treated to a myriad of labour horror stories. Some of the stories helped me figure out what I might want to do if medical interventions were needed during my labour (e.g. if you have to be induced, make sure you get an epidural at the same time), but most of the time they were just scary. Then, on the day before I left work to start maternity leave, a co-worker took me aside privately and shared her story with me. She doesn’t share her story in mixed company because she finds that other women often dismiss her story as a “good birth” and then proceed to share all the worst parts of their own labour. She wanted me to leave work with at least one story that could help me focus on the positive as I prepared to deliver my baby. I am so grateful that she shared and feel very blessed to be able to share a “good birth” story of my own. Zayden was only 3 days late, but it felt like two weeks because I had started my mat leave about a week and a half before my due date. That far into my pregnancy, I didn’t have much energy, so I just sat around waiting for something to happen. When it finally did, I wasn’t even sure it was the real thing. I felt my first contraction around lunch time; it felt like a strong menstrual cramp, and I figured it was a Braxton-Hicks contraction. I didn’t think it was a real contraction because my midwife had examined me earlier that day and told me that Zayden’s head still needed to come down and that I would probably wouldn’t go into labour until the weekend (it was Thursday). But the contractions kept coming, and I kept telling myself that they were Braxton-Hicks because they really didn’t hurt that much. But as the afternoon wore on, I began to find them more difficult to deal with. If I had admitted to myself that I was in labour, this would have been the time to use the yoga poses and breathing that I had been practicing because once things kicked into high gear all the stuff we’d practiced and packed for the hospital pretty much went out the window. So instead of being a blissful labouring mama with my candles, yoga mat and soothing music; I played the Sims all afternoon and got annoyed every time I had to pause the game and breath through one of my ever-stronger “Braxton-Hicks” contractions. By the time Justin made it home from work, I knew I was in labour. Around 9:30pm my water broke, and my midwife came to examine me. I was 3cm dilated, and she thought we’d deliver our son around 10am the next day. My contractions began coming every 3 minutes, and I didn’t get much rest in between because of what I called the “aftershocks” (a smaller, less painful contraction that came in between my real contractions). By midnight, I was exhausted from the contractions and didn’t think I could keep going until 10am without an epidural. I was also starting to feel a very strong urge to push with each contraction and figured that it was a sign that we should be at the hospital, so Justin called our midwife and asked her to meet us there. Luckily we’d gotten our things for the hospital together when my water broke, so all we needed to do was get our shoes and coats on. Justin had the foresight to put a chair by the door for me, which I needed as I had to deal with a couple contractions as we got ready to go. The car ride and our arrival at the hospital was a bit of a blur. When we got to the hospital, my midwife checked on my progress, and I was already 6cm dilated. She felt an epidural would just slow me down, so instead she gave me some Fentanyl. Based on my personal experience, Fentanyl is the perfect drug. It took the edge off the pain and helped me cope, but didn’t numb me, so I could still push effectively and really experience my son’s birth. It doesn’t work for everyone, but I would still suggest you try it before asking for an epidural; it may be all you need. It was around this time that my body took over. Time was meaningless. It felt like it both took forever and only an instant to push my son out, and when he arrived, it was the most incredible adrenaline rush of my life. So much hard work, so much pain, and then this incredible feeling of relief and joy. He was finally here! 2 minutes after Zayden was born, I told our nurse and midwife that I would do it again–that’s how profound and powerful an experience it was for me. The joy in seeing my son for the first time, the love I felt for my husband for his incredible support throughout it all, the pride I felt in my own body and its capabilities, is indescribable. I never felt stronger or more powerful in my life. 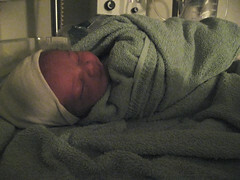 Zayden ended up being born at 4:16am after only 16 hours of labour–about 6 hours ahead of “schedule” for a first labour. We were blessed with an uncomplicated delivery and a healthy baby; it was a “good” birth. Here is what I learned from the experience that other moms-to-be may find helpful. You won’t need 90% of what you packed for the hospital. Specifically, leave behind any “comfort measures” you haven’t used while labouring at home. By the time you get to the hospital, you’ll have figured out what’s going to work for you when it comes to coping with the pain. Make ice chips out of Gatorade. Don’t make a detailed birth plan; let your labour story unfold on its own. Strive for “natural” childbirth if that is your goal, but don’t feel guilty or a failure if you ask for drugs or need a medical intervention like a c-section. The goal is a healthy baby, not a perfect labour.